Hangzhou at West Lake, China, 2018-Jul-28 — /Travel PR News/ —Dharshan Munidasa is Sri Lanka’s most renowned chef and restaurateur, best known for having founded Ministry of Crab and some of Sri Lanka’s most successful restaurants. The award-winning restaurant Ministry of Crab ranks at #25 on the 2018 edition of Asia’s 50 Best Restaurants List. Chef Dharshan and Ministry of Crab will officially launch at Four Seasons Hotel Hangzhou at West Lake from August 31 to September 1, 2018. “I feel lucky to have multi-cultural background,” says Dharshan. 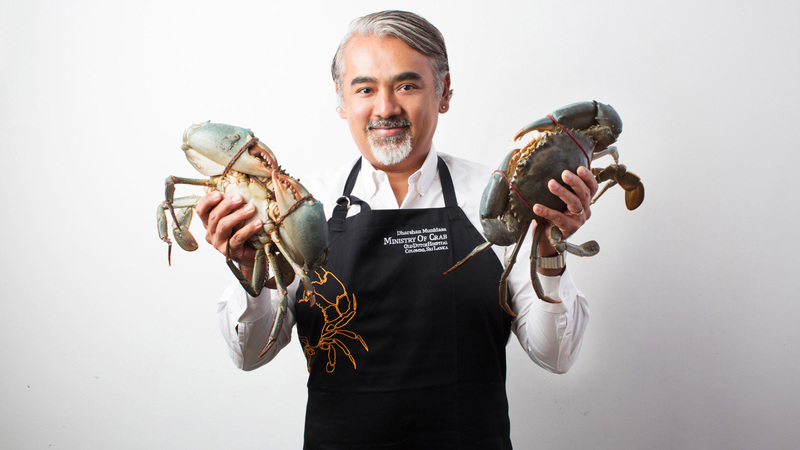 “Being a half Japanese makes me like to talk to the fishmongers, which helped me get a better understanding of my ingredients; while being a half Sri Lankan, I can come up with some decorating ideas by using bamboos and stones.” Dharshan is known for his focus on high quality, fresh ingredients that he often pairs with Japanese cooking philosophies. His hands-on involvement and his meticulous attention to detail have ensured the consistently high standards of his restaurants. The unparalleled ingredients and the commitment The ingredients used at the Ministry of Crab aren’t just the best, but also the freshest. Sourced and served in Sri Lanka, there is no way these crabs could be served as fresh anywhere else in the world. In fact, Ministry of Crab employs a daring no freezers policy, claiming, “the only use we’ve found for freezers is to store our food refuse prior to disposal,” as the co-owners believe that freezing both detracts from the taste and renders redundant the use of fresh produce. The restaurant’s commitment to showcasing the best of Sri Lanka extends beyond its use of local produce. It is one of few fine dining restaurants in Colombo to serve local dishes. While its curry dishes (crab curry, clay pot prawn curry, and chicken curry rice) are all excellent, it is the pol sambol, which is made on order, and the kade bread, the perfect accompaniment for any of the crab dishes, which have proved the unexpected successes of this past year. The other stand out items are the Small Island Iced Tea, a local take on the traditional Long Island Iced Tea, which is a combination of arrack and natural iced tea, and the Iced Tea Soda, an all-natural preservative free alternative to traditional soft drinks, which is unique to Ministry of Crab. This entry was posted in Food & Drinks, Hotels, Luxury, Resorts, Travel, Travelers and tagged crab, Dharshan Munidasa, Four Seasons Hotel, Hangzhou, Ministry of Crab, restaurant, West Lake, ‘Food. Bookmark the permalink.